joanofdark.com: Naptown Star Wars Bout! 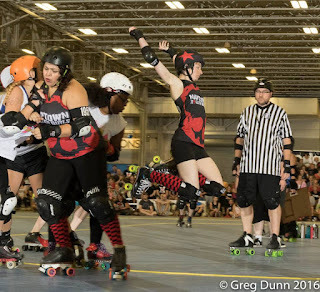 The final roller derby bout of season 10 is over and done. 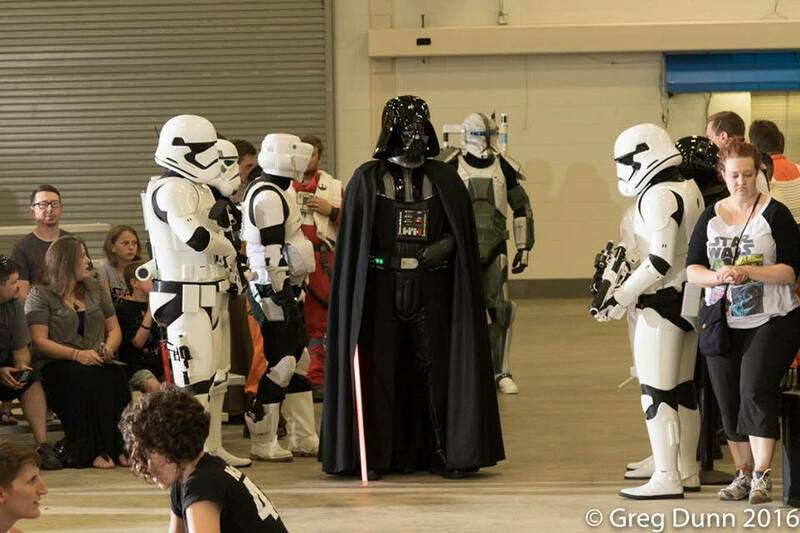 The Star Wars night is usually the best attended bout of the season and this seemed to be no exception. Bleachers were packed, suicide seating pretty full, and I saw them dragging more chairs out! **Also, a quick note on a trend I was noticing. More and more parents were trying to sneak their kids into the suicide section. Including parents with infants. Like, teeny, tiny, infants. I also saw people get pissy when they were asked to move, or go right back to suicide seating once the security or team member was away from that section. 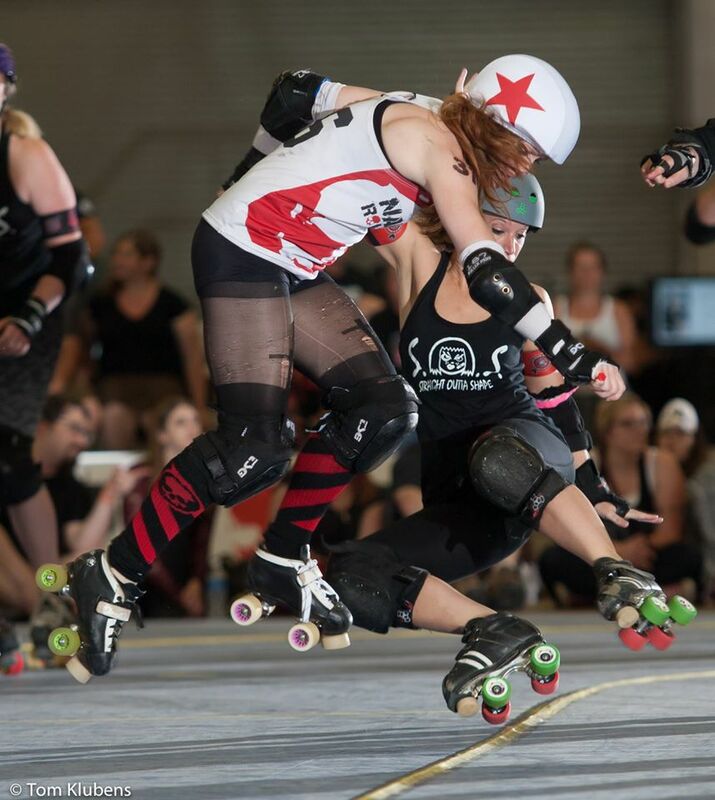 Parents, the roller derby team isn't just being a jerk to you by asking you not to sit trackside. They don't hate your kids, they aren't judging you for having kids, they're trying to keep you guys safe! I've taken a skate to the gut in suicides before. It hurts. But a skate to a baby? That's not going to hurt, that's going to severely injure or even kill your child. (Not to mention the time that, as a skater, I was knocked towards an infant in a car seat in suicides. I hurt myself trying to avoid hitting the baby. If I had hit the kid I can't imagine the emotional impact it would have had on me.) So come on, don't give the team a hard time about it and try to sneak back as soon as they turn around. 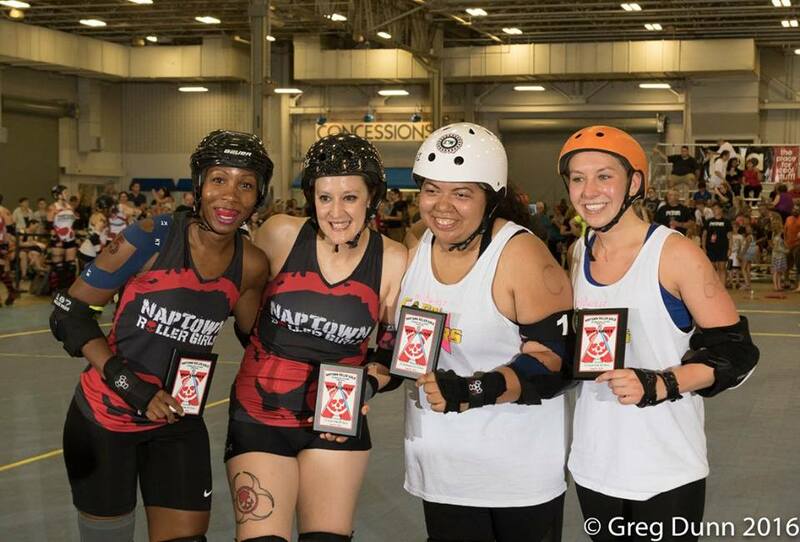 Both games were played against pick up teams, and it was the only unsanctioned bout of the home season. Belles lost against the Midwest Corn Stars. It was a crazy exciting game to watch, and included this apex jump, which I swear took about 5 seconds. The talent pool on the Belles is really deep. Lots of new jammers have been emerging this season. Including Brickhouse Massacre. She was an alternate for the bout, and ended up with a very well deserved MVP award for the night. Amazing to watch, and I would bet money on her being a siren jammer next season. Naptown has turned into a flying team the past couple of seasons. I think they spend more time in the air then on the track! Also cartwheels. Naptown does cartwheels to avoid out of bounds penalties. Still, the last 20 minutes aside, it was an exciting game. 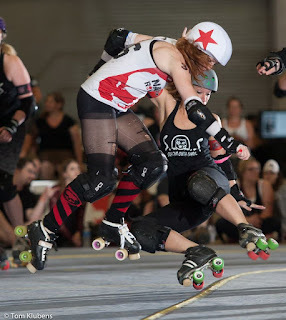 And when you considered the sirens opponent was a team made up of retired skaters and girls that hadn't really practiced together, they did a great job! Music, of course, on point. I don't think NRG has ever had a bad DJ, though DJ Kyle Long is becoming one of my favorites. Probably because he plays the soundtrack of my angsty youth. He's the sort of person that you want to become friends list, just to drop hints that you need a new mix cd and "sigh" wish you had someone who would make you that sort of thing. So excited to see what happens for playoffs this year, and for the Sirens and Naptown Roller Derby next season! Emma you need to visit Indiana and come to a bout!